In the heat, I skulked off to Sandy to take pictures of the Pioneer Day Parade Floats. Apparently, the floats go on display in the South Towne Exposition Center a few days before the parade proper. 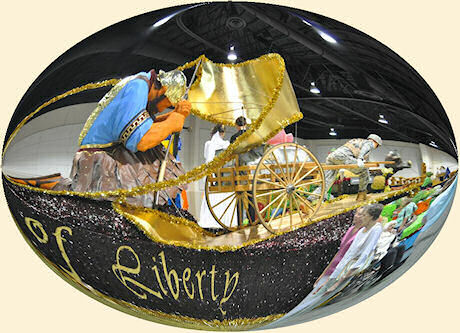 The float preview allows people to examine the floats close up at their leisure in an air conditioned room. Having seen the floats, I then took a brisk walk along the Trax line to the Sandy Trax Station, through Sandy proper and back to my blistering hot car. I had a root beer float at the Sonic Drive Inn. It was the first time I had eaten at a Sonic since my childhood in Oklahoma. I like the shape of the building, but I find the food served at the Sonic to be very scary. I'm with you on the Sonic thing. Cool modern-ish retro-ish design. Scary fare. The ones I have been to also have incredibly slow service.